We’re Hiring! See open positions below. GLCC Crew Leaders will be responsible for leading conservation crews consisting of members aged 18-25 years old. Leaders manage their crew on specific UP wide work projects, assigned throughout the field season. They are responsible for the safety of their crew, delegating tasks to ensure project deliverables are completed well, submitting weekly data sheets to supervisors, and organization of tools and supplies. GLCC Crews are stationed out of Marquette, MI. Read full GLCC Crew Leader job description here. Apply for a GLCC Crew Leader position here. GLCC Crew Members work within a small team to complete UP wide projects. Learn to camp, cook, live and work in a community setting. Become an environmental steward as you gain the knowledge of various conservation techniques and skills to leave a lasting impact for generations to enjoy. GLCC Crews are stationed out of Marquette, MI. Read full job description here. Apply for a GLCC Crew Member position here. The GLCC Ottawa Crew Leader will be responsible for leading conservation crews consisting of members aged 18-25 years old. Leaders manage their crew on specific UP wide work projects, assigned throughout the field season. They are responsible for the safety of their crew, delegating tasks to ensure project deliverables are completed well, submitting weekly data sheets to supervisors, and organization of tools and supplies. The GLCC Ottawa Crew runs chainsaws multiple weeks throughout the summer, and is stationed in Ironwood, MI. Read full GLCC Ottawa Crew Leader job description here. Apply for a GLCC Ottawa Crew Leader position here. GLCC Crew Members work within a small team to complete projects in the Ottawa National Forest. Learn to camp, cook, live and work in a community setting. Become an environmental steward as you gain the knowledge of various conservation techniques and skills to leave a lasting impact for generations to enjoy. The GLCC Ottawa Crew runs chainsaws multiple weeks throughout the summer, and is stationed in Ironwood, MI. Read full Ottawa Crew Member job description here. Apply for a GLCC Ottawa Crew Member position here. *Crew Leaders and Crew Members earn an hourly wage. *The GLCC season is Mid-May through Mid-August. Select GLCC crews work on projects though the fall. Questions? Please contact the GLCC Program Manager, Emily Leach at emily@superiorwatersheds.org. 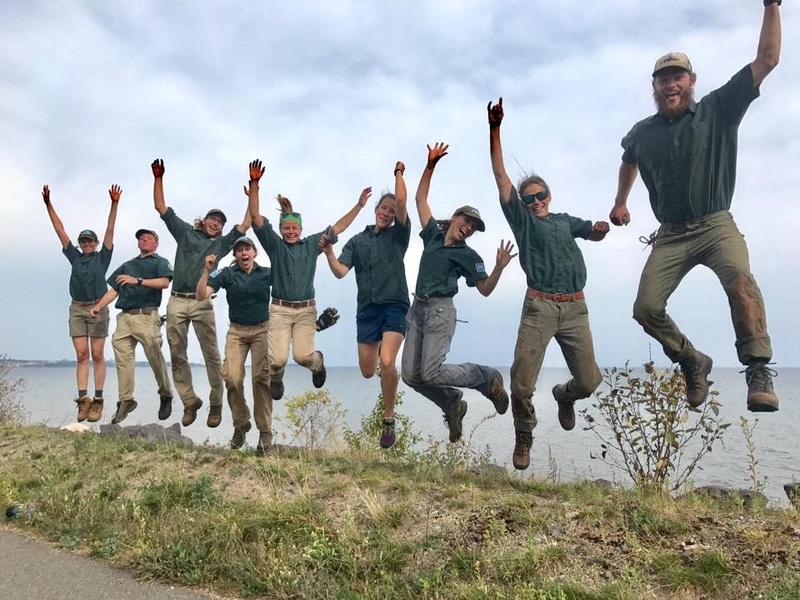 The SWP has expanded the Great Lakes Conservation Corps (GLCC) with the goal of completing more community based environmental projects throughout the Upper Peninsula. GLCC crews possess the ability to complete projects ranging from technical trail construction to habitat restoration. With passionate leaders and committed crew members the GLCC has the ability to complete nearly any project. The GLCC is available for service to municipalities, nonprofit organizations, agencies, etc. Please contact the SWP to determine rates and availability. GLCC crews work on a wide variety of conservation, restoration and recreation projects while the Climate Conservation Corps (CCC) is specifically dedicated to projects that help coastal communities adapt to climate change and increase community resiliency to more extreme weather events.